New fossils and fragments of ancient dinosaurs are found regularly these days. But once in a while, a fairly complete set of bones gives scientists a peek into possible new species. A small dinosaur found in the Judith River Formation in Montana in 2012 might be one of those breakthrough moments for paleontologists in Colorado. "I've been in this business for 30 years and once every couple years, we discover something new and special," Michael Triebold, President, Triebold Paleontology, Inc. and founder of the Rocky Mountain Dinosaur Resource Center told CBS News. "This is really special." The new fossils of a small, triceratops-like dinosaur were an almost complete set when they were found. Much to the surprise of the researchers, there was also some mummified soft tissue that had survived around its hip area. 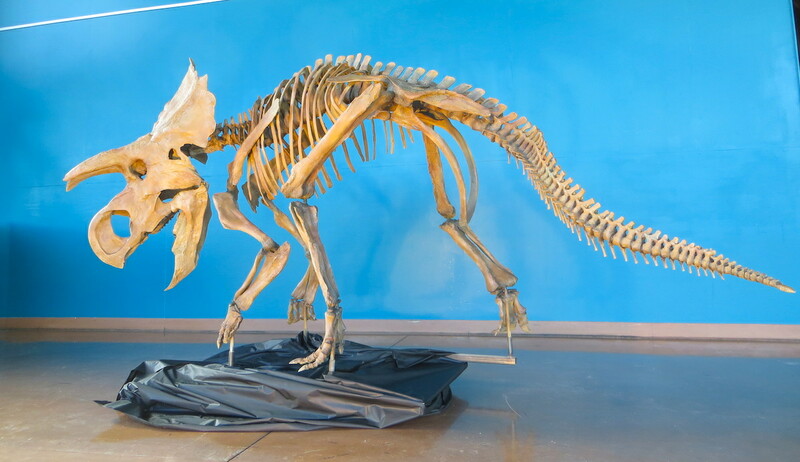 Over the past three years, paleontologists reconstructed its form and made a complete replica of it for display using laser scanning and 3D printing to fill in a few missing parts. "This is really a cute dinosaur, if dinosaurs can be cute," said Triebold. "It looks like a mini triceratops at a glance, but no nose horn." He said when they realized how similar the dinosaur was to a triceratops relative called an Avaceratops, they decided to call her "Ava." She's a unique baby ceratops, believed to be about 75 million years old from the Campanian stage of the Late Cretaceous, but 3 to 4 years old when she died. But there's no other known dinosaur like Ava, according to the researchers. Despite similarities in the skull to the triceratops, this one did not have a nose horn. About 80 percent of the skull was recovered. "We used used the best ceratopsian specialist in the world to make sure we weren't barking up the wrong tree," Triebold said. Ava has yet to receive a scientific name. Her replica was unveiled Wednesday and is on display at the Rocky Mountain Dinosaur Center in Woodland Park, Colorado.